When a window is too high to reach, a building is difficult to access by scaffolding, or a facility is too large to survey—call in the drones! 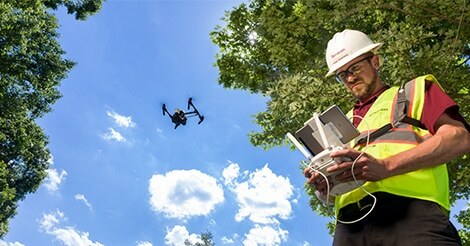 The introduction of small Unmanned Aircraft Systems (sUAS), or drones, has added exciting new options for providing building investigation services with greater accuracy and increased efficiency. Traditionally, assisting owners, architects, and contractors tackle building enclosure issues, performance deficiencies, and maintenance investigations of their properties has meant setting up staging equipment or acquiring the largest boom lift available and hoping for safe access. This access can be time consuming, expensive, and inadequate for the task at hand. Drones can provide a safer and quicker option for examining the components of a curtain wall, accessing a recessed ledge on an architecturally-challenging building, performing construction monitoring, or inspecting large roofs and structures in substantially less time. Access improvements and increased safety are attractive and easily recognized benefits of sUAS for due diligence services. The lesser known, more exciting, features are what drones are doing to revolutionize services and options for building investigations. Services such as photogrammetric mapping and thermographic imaging are quickly expanding in both application and effectiveness. Photogrammetric mapping is the use of photography for surveying and measuring distances between objects. Industry applications include mapping of architectural features for historic preservation, measuring existing structures’ elevations to be converted into CAD drawings and repair documents, and measuring spoil piles in geological and environmental earth moving projects. Photogrammetry allows a sUAS pilot to preprogram flight patterns over a desired location, and record the photos sequentially. The sequence of photos can later be “stitched” together to generate real-time overhead location maps, footprints of existing facilities, up-to-date elevation drawings for as-built documentation, and design and retrofit documentation. Thermography, a process utilized by building enclosure consultants for decades, is simplified through the use of sUAS. The value of a thermographic image allows technicians to identify temperature changes caused by possible moisture within a system, voids, or installation deficiencies not visible to the eye. Thermography equipment is most effective during a small window of time in the early evening dusk; when the sun has yet to set, but is low in the sky. Temperature differences between the roof assembly and the conditioned interior space are greatest during this time frame and allow for optimal imaging from thermographic cameras. Naturally expedient thermographic surveying of the roof area is critical for large facilities, but walking a large roof can be time consuming. Now, a thermographic camera can be mounted to a drone allowing the operator to cover more of the roof area. The GPS coordinates for all photos and drone footage are recorded when the image is captured, which allows for quick and accurate location and documentation. These new commercial capabilities require new licensing, permitting, safety considerations, and government oversight. The Federal Aviation Administration (FAA), state, and local authorities have several operation regulations of drones, with most states differing from federal requirements, and from one another. Private organizations, hobbyists, and businesses collaborate with the FAA to provide feedback for this dynamic industry, in an attempt to make sUAS effective and safe for the public. 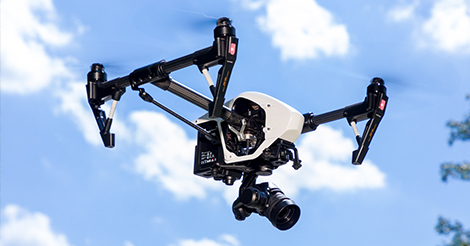 A remote pilot in command must be well aware of airspace when communication with air traffic control towers is required, where restricted and prohibited flight areas are designated, and of national airspace rules. This technology is rapidly accelerating the execution of building enclosure investigations. Terracon’s facilities professionals are using drones to help clients with large scale projects and routine maintenance inspections, making building inspections easier and safer than ever before. 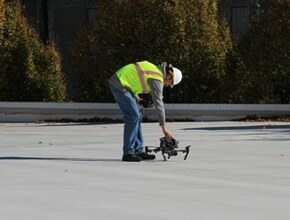 Ryan Daugherty, RRO, sUAS Pilot is a project manager in our Charlotte, North Carolina, office. Certified as a FAA sUAS remote pilot, Ryan has extensive experience in facility and building enclosure consulting.